I wish you a happy Monday morning! 1982 I founded DD-Studio, a record studio for music and advertising production, with my partner keyboarder Manfred Schiffinger. From 1987 the studio was renamed to “sounDDesign” studio. Schiffinger and I composed and produced more than 2.000 advertising jingles, film songs and music records from 1982 until 2001. Many of them with the Austrian singer with Australian roots Sandra Pires who was an exceptional talent discovered by sounDDesign in Helmuth Fink´s Papa´s Tapas – Atrium – Zugabe below the studio.. Later we also started to work with Sandra´s younger sister Orieta Pires. 1997 I had the idea of a new song and I wrote the lyrics by myself. Schiffinger and I recorded the song with Orieta and Christian Pogats, well known as the cook “Sebastian” in the TV series “Schlosshotel Orth”. I presented the track to Sony Music and they offered us a contract for one album – release all over Europe – and a budget of 1 million Austrian Schilling. But at the meeting which has been scheuled to sign the contract, Orieta suddenly refused to sign because the contract was exclusive. She told Sony the story that she and her manager Ziggy Müller found better opportunities in Germany. Later she never could get any record contract and at the end had to leave Austria to go back to Australia. Here´s “I love you” with Orieta Pires and Christian Pogats. Yesterday we heard songs of the exceptional artist Seaned O´Connor. She has an unmistakable style to let her voice tilt into the overtones. But she didn´t invent this vocal technique. Few years before I heard it the first time in a song performed by Sam Brown. Not very much later the technique was copied by many vocal artists. Please listen to Sam Brown´s song “Stop”. 4 Non Blondes was an American rock band from San Francisco, California, formed in 1989. The group was formed by bassist Christa Hillhouse, guitarist Shaunna Hall, drummer Wanda Day, and vocalist and guitarist Linda Perry. Prior to the release of their first album, Roger Rocha replaced Hall on guitar, and Dawn Richardson replaced Day on drums. They hit the charts in 1993 with “What’s Up?“, their only major hit single. Perry left the band in 1994 to begin a solo career, and the remaining members disbanded shortly after. Here´s their superhit “What´s Up” with 471 million video views on YouTube. One of my all time favorite songs is featuring anouther outstanding vocalist. Kylie Ann Minogue, OBE (/mɪˈnoʊɡ/; born 28 May 1968) is an Australian-British singer and actress. She achieved recognition starring in the Australian soap opera Neighbours, where she played tomboy mechanic Charlene Robinson. Appearing in the series for two years, Minogue’s character married Scott Robinson (Jason Donovan) in an episode viewed by nearly 20 million people in the United Kingdom, making it one of the most watched Australian TV episodes ever. Since then, Minogue has been a recording artist and has achieved commercial success and critical acclaim in the entertainment industry. Minogue has been recognised with several honorific nicknamesincluding “Princess of Pop” and “Goddess of Pop”. She is recognised as the highest-selling Australian artist of all time by the Australian Recording Industry Association (ARIA). In this song she´s performing with the legendary Nick Cave. Greg Usek and Sergio Flores, worked already with Kylie Minogue. Here´s another exceptional vocal artist. To date, Cherry has released four studio albums. Her first, Raw Like Sushi was released 1989 and peaked at number three on the UK Album Chart, thanks in large part to the worldwide hit single “Buffalo Stance“. Her second studio album was 1992’s Homebrew. Four years later she released Man, and then released her most recent studio album Blank Project in 2014. In addition to releasing these studio albums, she formed the band cirKus in 2006 and has collaborated with The Thing, releasing an album entitled The Cherry Thing in 2012. She also performed in a number of punk and post-punk bands in her youth, including The Slits and Rip Rig + Panic. My favorite video of Neneh Cherry is “Woman”. Onika Tanya Maraj (born December 8, 1982), known professionally as Nicki Minaj (/mɪˈnɑːʒ/), is a Trinidadian-born American rapper, singer, songwriter, model, and actress. [Born in Saint James, Port of Spain, Trinidad and Tobago and raised in Queens, New York City, New York, she gained public recognition after releasing the mixtapes Playtime Is Over (2007), Sucka Free (2008), and Beam Me Up Scotty (2009). Early in her career, Minaj was known for her colorful costumes and wigs.Her rapping is distinctive for its fast flow and the use of alter egos and accents, primarily British cockney. Minaj was the first female artist included on MTV‘s annual Hottest MC List. In 2016, Minaj was included on the annual Time 100 list of the most influential people in the world. As a lead artist, she has earned four top-five entries on the Billboard Hot 100: “Super Bass” in 2011, “Starships” in 2012, “Bang Bang” and “Anaconda“, both in 2014. Throughout her career, Minaj has received numerous accolades, including six American Music Awards, eleven BET Awards, three MTV Video Music Awards, four BillboardMusic Awards, a Billboard Women in Music Rising Star Award, and ten Grammy Award nominations. She has the most Billboard Hot 100 entries among women of all genres in the chart’s history. 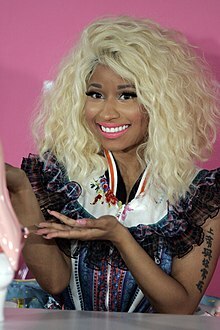 Minaj has sold 20 million singles as a lead artist, 60 million singles as a featured artist, and over five million albums worldwide, making her one of the world’s best-selling music artists. Here´s Niki Minaj with Lil Wayne – “Knock Out”. 70 million video views on YouTube. I want to finish this 3d part of the special wth Suzanne Vega. Tomorrow the next special about famous film songs starts. Don´t miss it!